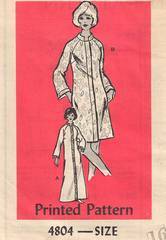 Vintage Anne Adams mail order sewing pattern from 1969. Misses' robe in short or long length has novelty ribbon trim and aconcealed front zipper closing. Size 16; Bust 38; Waist 29; Hip 40. Comes with original mailing envelope and newspaper ad/clipping dated November 1969.